After a long summer, I’m headed back to my second year of grad school. One of the best things about summer has been having the time to garden and cook! Now that the crush of the school year is upon us again, I’ll be making a lot of these quick, easy wraps. 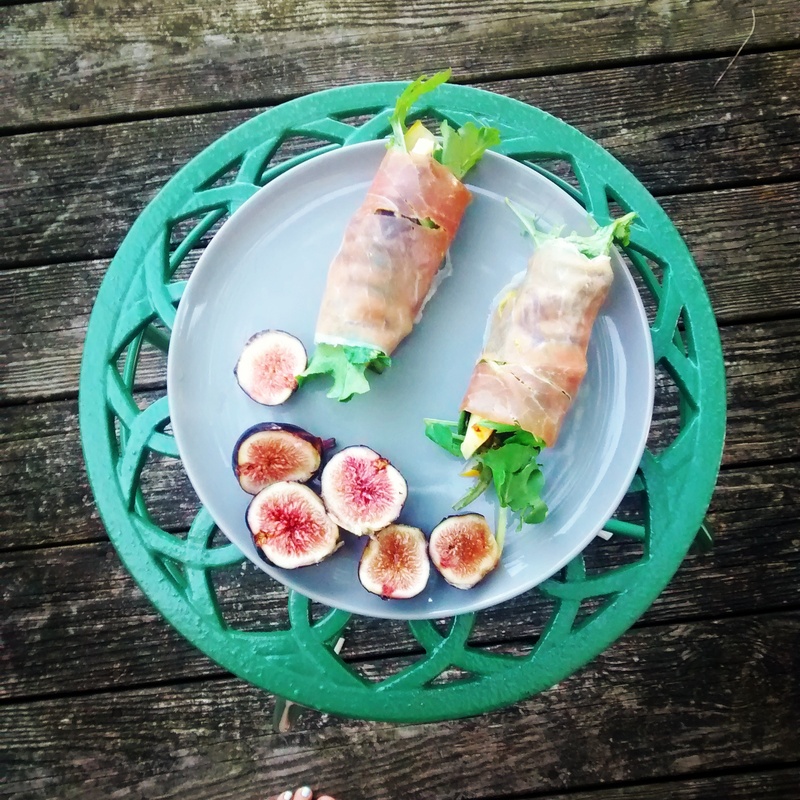 These prosciutto wraps are yummy, surprisingly filling, and so quick to make! With the ingredients on hand, I can make them in less than five minutes. 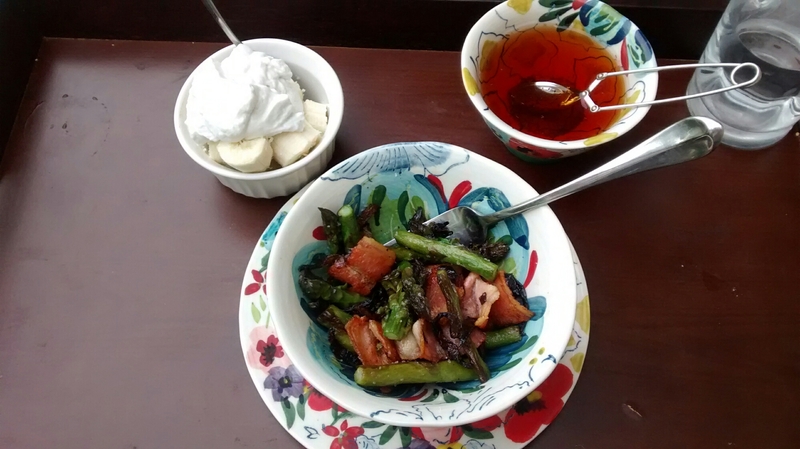 Served with fresh figs and homemade refrigerator pickles, it’s the perfect summer meal. 1.) Spread mustard on the slices of prosciutto. Assemble pickles, avocado and cheese on one side of the prosciutto and roll it up. Enjoy! Since getting a new grill for my birthday, Mike and I have been grilling something or other almost every single night! This salad is quick, easy, and incredibly delicious! Start to finish, it takes me less than 20 minutes to create and has become a go-to in our house for weeknight meals. 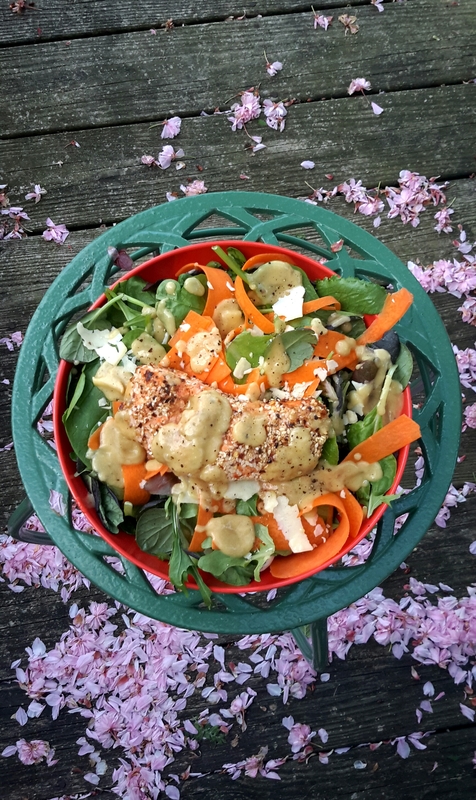 The Sesame Ginger Vinaigrette is delicious and I usually make extra to carry with me in my purse for lunches out. 1.) Place all ingredients into a container and blend. I find that my immersion blender whips up the creamiest version of this vinaigrette that won’t separate. For a more traditional vinaigrette, grate ginger and mince garlic and then emulsify. 1.) Pre-heat grill on medium heat. 2.) Mix greens with shaved carrots. Shave romano cheese over the top of the salad. Set aside. 3.) Mix sesame seeds, s/p. and red pepper flakes. Coat salmon fillets with mixture. 4.) Grill on both sides for 5 minutes. Depending on how hot your grill gets, it should be medium rare in the middle. 5.) Serve on top of salad and enjoy! For my 28th birthday, I wanted to make myself a carrot cake. 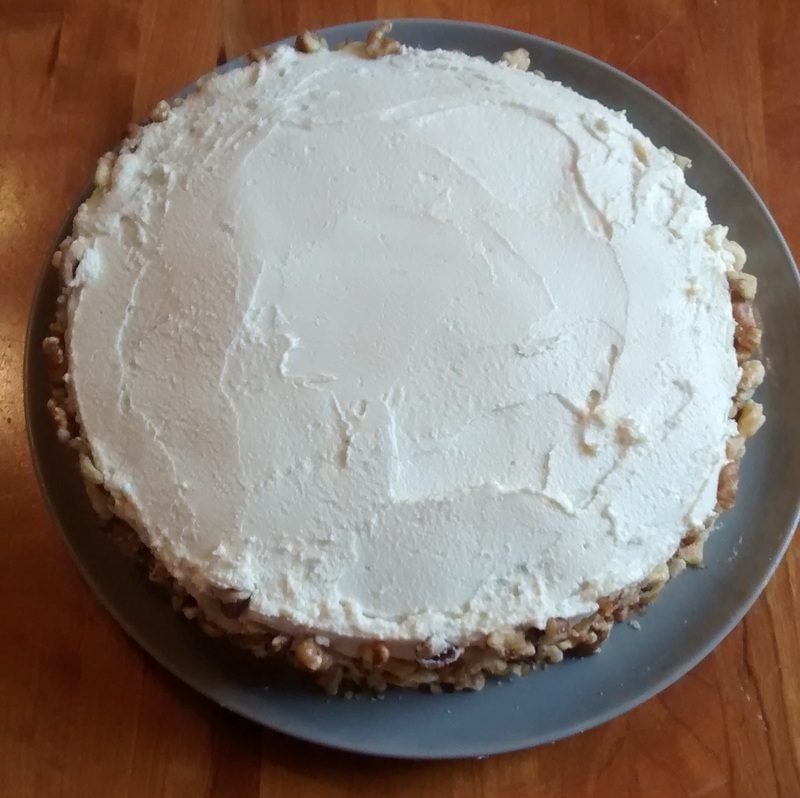 I tried making a carrot cake about 2 months into the SCD diet, almost three years ago, but since I couldn’t use cream cheese, I made a glaze out of coconut butter. It just wasn’t the same. I missed the tangy creaminess of the cream cheese frosting. During my last flare, I pinned a picture of Primal Palate’s Carrot Cake with the caption, “This is going to be my celebratory meal, once I’m out of this flare.” I didn’t quite live up to that promise, but my birthday presented the perfect chance to give it a try. I followed their recipe for the cake, which you can find here. It was delicious- one of the best carrot cakes I’ve ever had in my life. I decided to try cream cheese frosting that used SCD legal Farmer’s Cheese in place of cream cheese. After a few trial and errors, I came up with one that tasted very similar to the same thing, though with a slightly different (though still delicious!) consistency. In fact, my husband said that he preferred it to real cream cheese frosting! 1.) Melt the butter and cheese, so that they are soft, but not entirely runny (about 40 seconds in the microwave). 2.) Place in blender and blender until smooth, which takes about 30-45 seconds. 3.) Add honey and vanilla and blend until incorporated. 4.) At this point, it will be runny and in a liquid state. Remove from blender and place it in the freezer for 10 minutes. It will harden and become spreadable. Don’t put it in there for too long or it will freeze! 5.) Remove from freezer and spread on cake (or muffins). Enjoy! It’s been hard to blog lately and the biggest reason for that is that I just climbed out of yet another Crohn’s flare. It’s galling to admit, and somehow feels like a personal failure, but it has reared it’s ugly head and I was once again caught in the undertow. It actually started last February but was really mild. 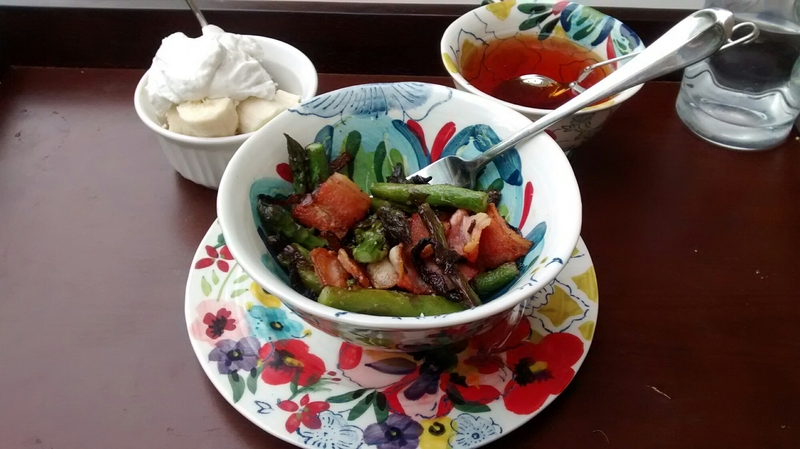 I altered by diet and started eating the SCD intro diet. It seemed like it was getting better but after a month of minimal progress, I went into the doc and made the hard decision to start another temporary medication. After that, it felt like a series of concessions. In May, I tried eating the AIP modification for SCD since I still felt like I wasn’t getting better as rapidly as I wanted to. I added in yoga and removed as much stress as possible from my life. While yoga was an incredible addition and I’m so glad I’ve found it, it didn’t stop the flare. At the end of May, we left for a much anticipated European vacation. Reluctantly, I agreed to increase one of my medications. I think what sparked the craziness is the European trip. The combination of lack of sleep and new foods (although I still ate 100% on my diet and made the majority of my food there- more about that in another blog post) I think my body just couldn’t handle it. It mostly held together while we were in Europe and then promptly fell apart when we got home. Within a week of getting back from Europe, the flare had spiraled into something unmanageable by diet and minor medication modification. Two ER visits and an emergency abscess surgery removal later, I made the decision to temporarily go on Remicade again to try and stop the madness. While the SCD diet has helped me maintain my health for 2 years, it wasn’t working and I was running out of options. It’s so frustrating and feels like a personal defeat but it’s where we’re at. One thing that has been running through my head in the last 12 months and was only re-enforced as I lay in the hospital bed recovering from the surgery, is my inability to control my health. One of the amazing things about eating the way that I do is that it has given me back a much needed sense of control and I feel like I can actually effect some positive change in my life. However, this sense of control is ultimately incomplete. I’m not in control. I cannot cure myself from this disease and no medication or diet can either. God is in control though. This is true for everyone but I think being chronically ill gives you a panoramic view of this inescapable fact. God controls healing; we don’t. Eating healthy can help you be healthy. Eating the way that I do mitigates some of the effects of this awful disease but I can’t fiot my cure. Nowadays I am much better. I’m still on some heavy duty meds but I’ve persisted with the scd diet and the combination seems to be working. It’s not what I want but I’m grateful to be healthy again. As I continue to heal, I hope to rely more on the diet. For now, it’s in God’s hands. Breakfast has been a bit of a challenge on the Auto Immune Protocol. 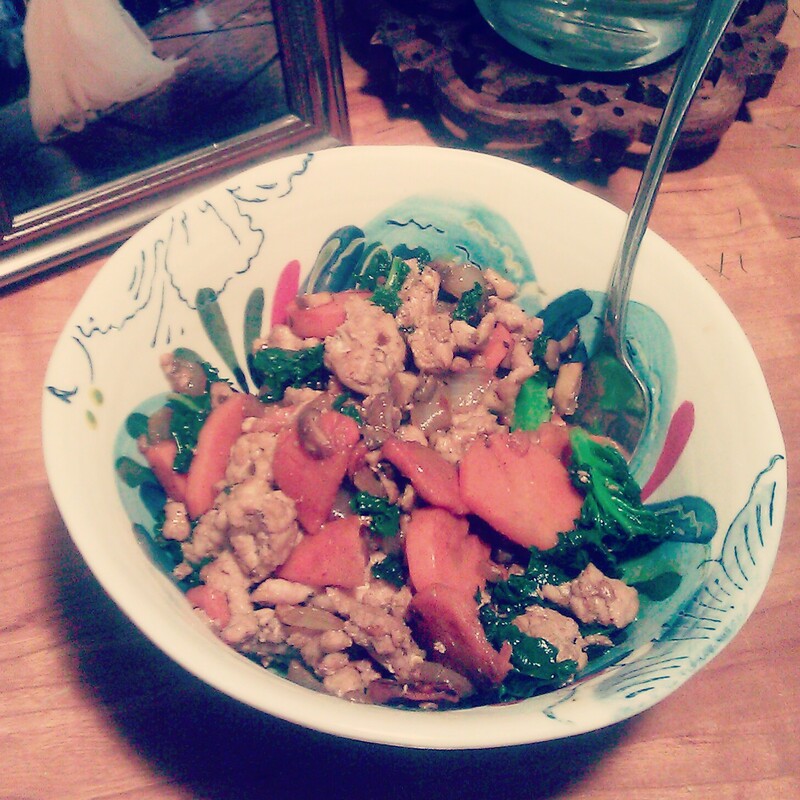 Luckily, I happened upon this delicious veggie skillet and have been eating it like a fiend! It’s really flavorful and still tastes like breakfast. Pair it with a banana and coconut milk whipped cream and you’re in business! 1. Wash, chop, and shred veggies. Cut bacon into bite sized pieces. 2. Heat coconut oil over medium heat in a medium sized skillet for about 2 minutes and then add beets. Cover with lid and cook for about 5 minutes. 3. The beets should be getting brown on the bottom. Flip them with your spatula and add the asparagus to your skillet. Cover again for 3 minutes. 4. Remove cover and use spatula to shift beets if they are starting to burn. Add bacon. Don’t cover but continue to shift them around occasionally, checking frequently to prevent burning. Cook for about 5 minutes and remove from heat. 5. Salt and pepper if desired. Enjoy! I’ve been battling a mild flare for the last couple months. It’s frustrating and discouraging after two years of being virtually flare free to be struggling again. Luckily it’s relatively small, at least compared to previous flares, and doesn’t seem to be getting worse. One step I’ve taken this past month is to try the paleo auto immune protocol. It’s designed to eliminate common irritants and has a whole science of its own, but suffice it to say, this month in addition to the rest of the food I don’t eat, I’ve added nuts, seeds and seed based spices, nightshades, dairy and eggs. Ugh. I kind of hate it but I keep reminding myself that it’s not forever, that healing comes first, and that it’s a privilege to live in a country where it is possible to make these kind of choices for myself. 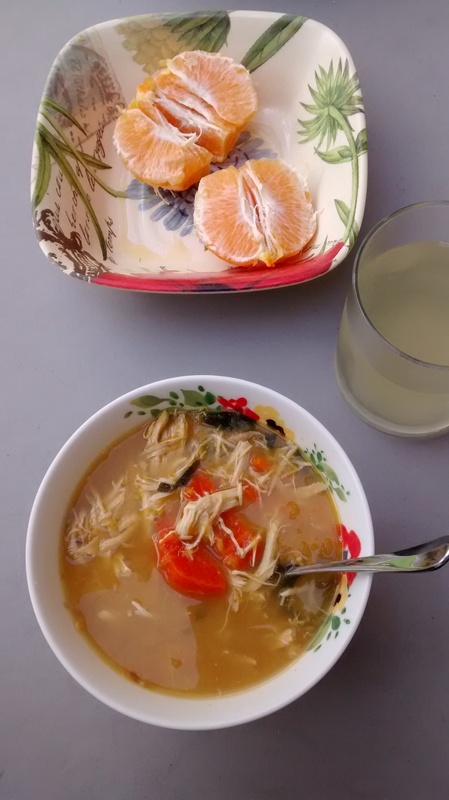 One food that we’ve been eating fairly regularly, as in multiple times a week, is this simple soup. I buy a whole chicken every week, roast it, and use half the chicken to make this and the bones to make bone broth. We love it. It’s simple, rich and filling. Perfect for the AIP. My biggest fans have actually been my in laws who are about as far from being paleo as humanly possible. 1. Add chicken, carrots, butternut squash, bone broth and water to a pot and bring to a boil. Adjust heat and simmer for 20 minutes. 2. Roast or microwave acorn squash (40 minutes in the oven at 375 or 6 minutes in the microwave). Once cooked, add to pot. 3. Chop or tear spinach. Add after 20 minutes and simmer for an additional 5. Remove from heat and add salt. For more information about the auto immune protocol, I recommend reading The Paleo Approach by Dr. Sarah Ballantyne. 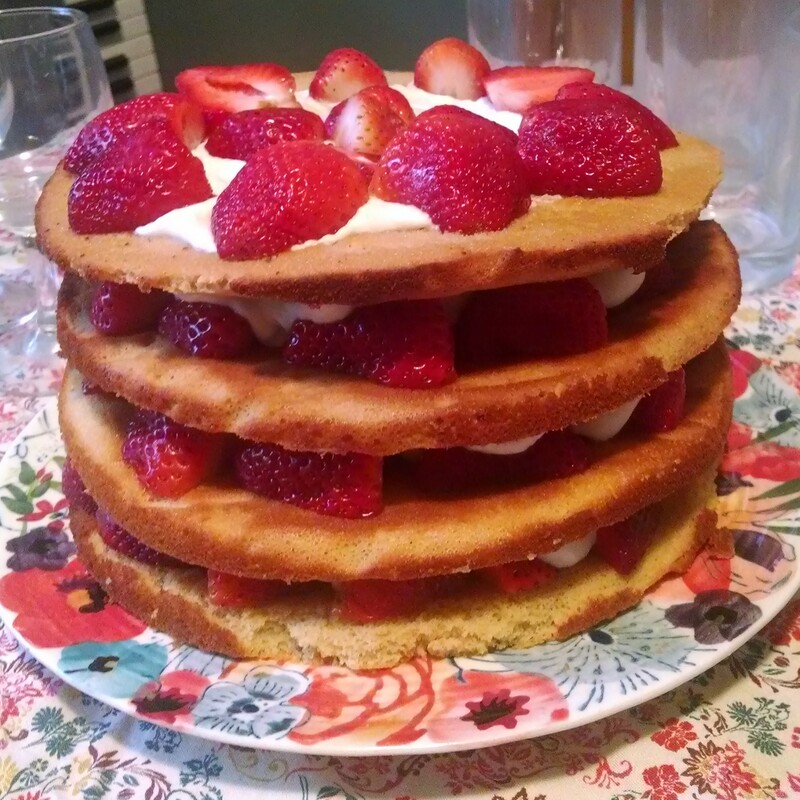 Once again, it’s been a long time since I’ve posted but I wanted to post some pictures of the incredible grain-free Strawberry Shortcake that I made for my birthday! I used the recipe last July for some patriotic triffle and was excited to see that Jenni, over at the Urban Poser, had made it into a cake as well. It was incredible and does not taste grain-free at all. It’s dense, like a lot of coconut flour recipes, but very moist, sweet and the coconut whip cream gives it a sort of airiness. I used 9 inch pans so my creation did not turn out as ethereal and lovely as Jenni’s but it was mouthwateringly delicious and a definite crowd pleaser. Find the recipe and instructions here! I recently had the awesome experience of a restaurant completely catering to my dietary needs. My company hosts a lot of lunches there and the hospitality manager worked with the chef to create a dish specifically for me. It was pretty significant as it’s a Korean-American fusion restaurant that makes its bread and butter with foods I can’t eat. They made an awesome ground turkey stir fry and talked with me about what they put in it. I think I’ve been able to replicate it almost to a tee. They didn’t add coconut aminos but I couldn’t resist. We’ve eaten it about 5 times over the last month as it takes less than 30 minutes from start to finish and tastes awesome. Enjoy! 1.) Combine the first seven ingredients in a blender and blend until sauce forms, minus 1 Tablespoon of Sesame Oil. Heat 1 Tablespoon Sesame oil in large pan over medium heat. Add garlic and saute for about 2 minutes. 2.) Add ground turkey to garlic and brown on both sides. Drain any access liquid and add carrots and onions. Cook for 5-7 minutes or until carrots soften and onions are translucent. 3.) Add mushrooms and add sauce. Cook for another 3 minutes and add spinach. Cook for another 2 minutes or until the greens are wilted. Chicago has been horrible this winter. Snow so formidable that I’m afraid to drive the two miles to the grocery store. Cold so fierce that I literally spent three days in my house, until I literally couldn’t stand it any longer- and I’m from Minnesota! You would think that it would have resulted in a burgeoning of this blog, as I filled your news feed with stories of my snow induced cooking. However, hibernation seems to have had an all encompassing grip on my creativity and I’ve found myself recreating other bloggers’ recipes for most meals. The light has also been fairly poor and so all of my food photos have been fairly cave-like and unappetizing. However, I have been loving this easy recipe that I recreated based on an non-paleo favorite of mine. It’s hearty and filling and easy to transport for lunch. I love the creamy, semi-sweet taste of the mayo with the firm crunchy of the celery and sweet burst of the grapes. It makes enough for four large servings. 1.) Pre-heat oven to 375 degrees. Prepare the chicken breasts with the salt and pepper from the recipe. Cook for 40 minutes. 2.) Chop celery, half grapes and pecans (if needed). 3.) 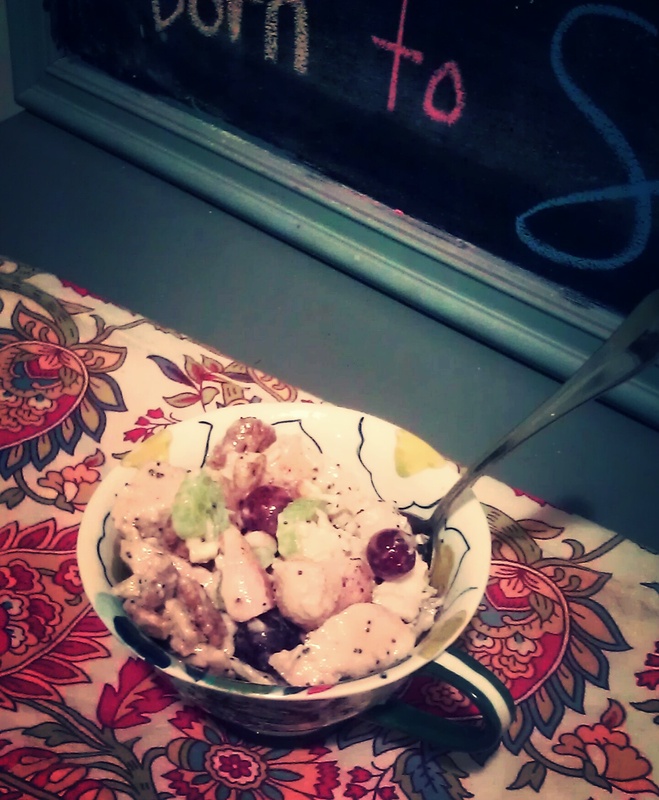 Cube chicken and add to celery, grapes and pecans. Combine Mayo with honey and add to mixture. Add poppy seeds. 4.) Chill for 1 hour before serving.